"I need someone who knows the wild places of the world… And you're the world's greatest adventurer!" This looks like so much fun. 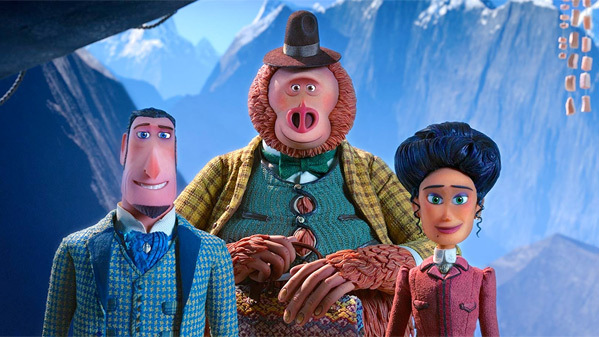 Annapurna has debuted a second trailer for Missing Link, the next fun movie from Portland-based stop-motion animation studio Laika (of Coraline, ParaNorman, The Boxtrolls, Kubo and the Two Strings previously). The story introduces us to Mr. Link, a big furry creature, and the man who is out to prove his existence: the charismatic Sir Lionel Frost, who ends up befriending him. Featuring the voices of Hugh Jackman, Zoe Saldana, Zach Galifianakis, Timothy Olyphant, David Walliams, Emma Thompson, Matt Lucas, Ching Valdes-Aran, Stephen Fry, and Amrita Acharia. I'm always excited about Laika's new films, there's something really unique and wonderful about them. And this looks like it's going to be a good time. In addition to all the character design, I dig the voice acting in the trailers. You can still see the first full trailer for Laika's Missing Link here, to rewatch the original introduction. This April, meet Mr. Link: 8 feet tall, 630 lbs, and covered in fur, but don’t let his appearance fool you… he is funny, sweet, and adorably literal, making him the world’s most lovable legend at the heart of Missing Link, the globe-trotting family adventure from LAIKA. Tired of living a solitary life in the Pacific Northwest, Mr. Link recruits fearless explorer Sir Lionel Frost to guide him on a journey to find his long-lost relatives in the fabled valley of Shangri-La. Along with adventurer Adelina Fortnight, our fearless trio of explorers encounter more than their fair share of peril as they travel to the far reaches of the world to help their new friend. Through it all, the three learn that sometimes you can find a family in the places you least expect. Missing Link is written and directed by English filmmaker Chris Butler, director of Laika's ParaNorman previously, as well as head of story at Laika and a storyboard artist. Annapurna Pictures will release Laika's Missing Link in theaters everywhere starting on April 12th in the spring. Still lookin' good?